WATKINS GLEN, N.Y. – Chris Buescher is still on the outside looking in, but probably not for long. After last Sunday’s unexpected NASCAR Sprint Cup Series victory at Pocono Raceway, Buescher is still 31st in the standings, six points behind 30th-place David Ragan. In order to qualify for the Chase, Buescher must be in the top 30 after the 26th race of the season, scheduled for Sept. 10 at Richmond. Buescher is confident he can meet the challenge. “If we look at it now, we’re in good shape to be heading forward,” Buescher said on Friday at Watkins Glen International, site of Sunday’s Cheez-It 355 (2:30 p.m. ET on USA). “Our cars have been a lot better each and every weekend. The last six or seven or eight weeks, we’ve been unloading with a lot better speed and finishing better and staying running better in the race. For one thing, there are no more superspeedway races before the Chase starts. Buescher crashed out of all three restrictor-plate events this season, with his only other DNF coming at Kentucky. Henceforth, Buescher also will get better equipment on a consistent basis from Roush Fenway Racing, which farmed him out to Front Row Motorsports for his rookie year in the Sprint Cup series. 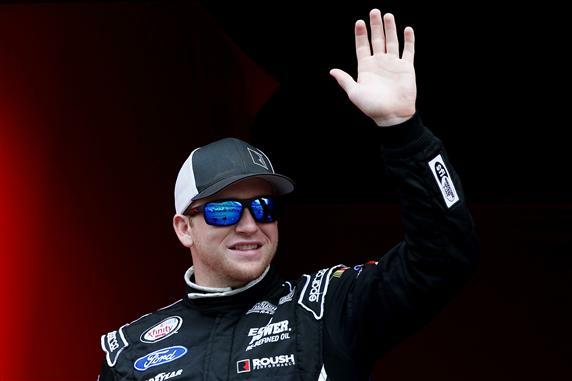 “As we go forward, we have had pretty awesome support from Roush Fenway this year,” Buescher said. “A lot of the races we have been kind of half-and-half on what we’re doing, but as we look at the Chase coming up here, I think we’ll be able to try to step up our program as much as possible. With that in mind, Buescher is optimistic about making the Chase. “We’ll get there,” he said.